Breath Of Life Daily: 12 Art Prints That Inspire Me On Minted. 12 Art Prints That Inspire Me On Minted. First off, let me say this, I just found out about Minted.com and visited their site... I love them! 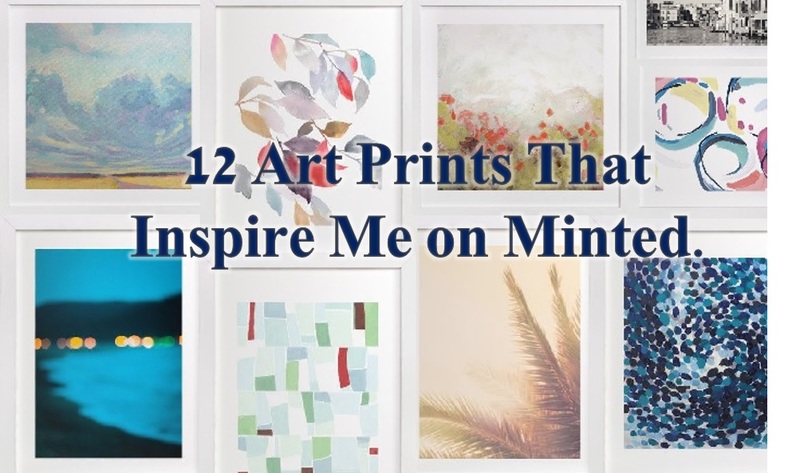 Minted.com is a collective of greatness, so much talent in one place, and I'm so here for that. Minted. is a marketplace for independent artist to share their work. The website is amazing! It has some great pieces. Also, they have stationary, I'm big on stationary, planners, invitations, and all that good stuff, especially being a writer. It was the first one to catch my eye and attention. I love clouds. The beauty and the texture of this piece really stood out to me. There is such skill by the artist in capturing the color undertones and the visual story of the image. It's filled with beauty and magnificence. I want to go into that place where the clouds are. It's apparently (In this picture) some place to go and it makes me long to feel that calm, that it presents. Foilage, oh Foilage! It's so beautiful. The colors are amazing! we are all different leaves on a branch so many colors and our own uniqueness. I like the imagery that this piece creates. It shows that the artists knew how to arrive at the desired result using what they had. Very skillful. It looks like a rose bush to me. This is artistic talented work and I love flowers, especially roses. I would use this in my house to decorate with. It makes for a good accent with the decor of a warm, sunny, happy home. Love this shining palm. I'm from Florida originally, so I love seeing the beautiful palm trees whenever I go down to visit. This image is from California, I believe, but for me it brings about a homey feel, not to mention the angle of the shot is glorious. The image is just beautiful. It's something you'd wanna see on a day you're traveling into town...welcoming beautiful palm trees in sunshine. Delightful. Color contrast. I love this blue and green with the specks of red sitting out for effect. It truly does look like an image from the sky, dreamed up from the artists mind. It pops, in a good way. If you're a fan of pineapple...you get it. Even if you're not a fan, beyond the mouthwatering appeal this picture is very clear. It's direct, focused, and makes a statement...a BOLD statement. "I alone, by myself, with know distractions or fancy backgrounds...I am enough. That's one conscious pineapple! Sunset Study produces a familiar feel that comes over the distance. It's a reminder that joy comes in the morning. No matter what we go through, the sun will rise again, It's a beautifully imagined evening sunset. This image reminds me of driving up to a party or social activity, where the people are. The dim, out of focus perspective is a testament that there is light, even amidst mediocrity, and where there's light there is life. The lovely bits! These are "bits into the blue". I'm in love with blue, and it's a great decor' piece. Simple beauty. My grandmother use to have a picture just like this in her house. It brings back sentimental feeling and memories, and at the the same time it makes me want to travel and go somewhere far away that I've never been before. (Italy, maybe.) Pretty much anywhere that's not where I am. This picture makes me believe and wander. There's motivation here, motivation for something better. Love this! The color contrasts here rock! The sisters here are similar, but different in personalities, that's how we know they're sisters. It is an image of us all. Human kind as a whole, we belong to each other, but we have differences in authenticity. Beyond the meaningfulness of the lesson the picture is just nice to look at. Are the four sisters: style, class, elegance, and sophistication? because that's what this painting says to me. Last, but not least: Big Sky Country. This is the beauty I want in my life, the image itself, and the feel it brings. Can you tell I love clouds? Clouds denote the glory of God. There is such an animated clarity here. It's clearly skillful work by the artist. Another plus... it looks like Mufasa from The Lion King is about to come breaking through the clouds at any minute. Very glorious and splendid. What is your take on these 12 prints? Did you find these or any of the other products and prints inspiring at minted.com? Let me know in the comments... You can also follow this conversation with Breath Of Life Daily + Minted. via social media on Twitter, Facebook, Google+, and Pinterest.